A newspaper featuring an announcement made by Orlando Postmaster Lucius A. Bryant. According to the article, post office trucks would be available at 12 shopping centers in Orlando the following day. The mobile post officers sold Christmas stamps and mail delivery service. Bryant also announced that the Downtown Orlando Post Office would be open for the afternoon. 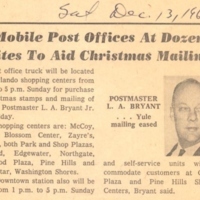 Original newspaper article: "Mobile Post Offices at Dozen Sites to Aid Christmas Mailing." December 13, 1969: Private Collection of Texann Ivy Buck. 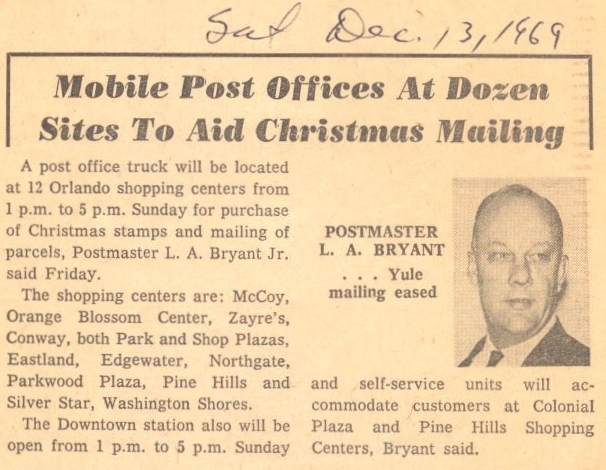 “Mobile Post Offices at Dozen Sites to Aid Christmas Mailing.” RICHES of Central Florida accessed April 26, 2019, https://richesmi.cah.ucf.edu/omeka/items/show/7627.